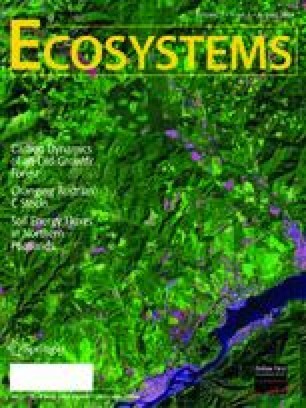 This report summarizes our current knowledge of leaf-level physiological processes that regulate carbon gain and water loss of the dominant tree species in an old-growth forest at the Wind River Canopy Crane Research Facility. Analysis includes measurements of photosynthesis, respiration, stomatal conductance, water potential, stable carbon isotope values, and biogenic hydrocarbon emissions from Douglas-fir (Pseudotsuga menziesii), western hemlock (Tsuga heterophylla), and western red cedar (Thuja plicata). Leaf-level information is used to scale fluxes up to the canopy to estimate gross primary production using a physiology-based process model. Both light-saturated and in situ photosynthesis exhibit pronounced vertical gradients through the canopy, but are consistently highest in Douglas-fir, intermediate in western hemlock, and lowest in western red cedar. Net photosynthesis and stomatal conductance are strongly dependent on vapor-pressure deficit in Douglas-fir, and decline through the course of a seasonal drought. Foliar respiration is similar for Douglas-fir and western hemlock, and lowest for western red cedar. Water-use efficiency varied with species and tree height, as indexed using stable carbon isotopes values for foliage. Leaf water potential is most negative for Douglas-fir and similar for western hemlock and western red cedar. Terpene fluxes from foliage equal approximately 1% of the net carbon loss from the forest. Modeled estimates based on physiological measurements show gross primary productivity (GPP) to be about 22 Mg C m−2 y−1. Physiological studies will be necessary to further refine estimates of stand-level carbon balance and to make long-term predictions of changes in carbon balance due to changes in forest structure, species composition, and climate. This research was supported by the Office of Science, Biological and Environmental Research Program (BER), US Department of Energy (DOE), through the Western Regional Center (WESTGEC) of the National Institute for Global Environmental Change (NIGEC) under Cooperative Agreement DE-FC03-90ER61010. Authors who are investigators with WESTGEC funds to work at the site include W. E. Winner, J. Berry, B. J. Bond, T. Hinckley, J. Ehleringer, B. Lamb, and S. C. Thomas. Dr. Thomas Suchanek, WESTGEC Director, along with Dr. Susan Ustin and the WESTGEC staff, have helped create the focused interest in analysis of carbon balance at this site. We also greatly appreciate the efforts of Dr. David Shaw, Director of the Wind River canopy crane site, who has provided assistance in organizing research and providing logistical support at the site. We are particularly indebted to Mr. Mark Creighton, and those who “bell” the crane, for safely moving us through the forest canopy with the precision and care necessary to gather physiological data in the forest canopy without damaging trees.